Here in this article are providing you the way to sign up / register OyeRecharge.com for login. This will include full the tutorial to create account easily on the website. Besides it, we are also sharing the features of OyeRecharge.com, change password, profile details, email Id, phone number, how to earn money etc. too. There are few similar sites which offer people to earn free recharge money. Those are 160by2, FullonSMS, Faatsy, Way2SMS, Amulyam, Laaptu, etc. 1. Go to the official website of OyeRecharge.com. 2. Fill the sign up form by providing your appropriate information like Name, Email ID, password (desired), Mobile Number, Gender, Date of Birth, City and click on Sign Up button. 3. After that login into your Email account. Follow the mail received by OyeRecharge and complete the account verification process by clicking on the link. 4. Now, you have your active account on the website. As you have completed the registration process. Login by using your email ID and password to take advantages of the features of the website. Join site for free, without charges. Complete offers to earn credits. Install extensions to earn free recharge credits. Like pages and earn credits for free. Refer your friends to earn money for the recharge. Recharge your mobile phone by using the credits into your wallet. Minimum amount should be Rs.10/- to make recharges. To change password of your account. Go to My Profile section in the Menu Bar. Click on Change Password tab. Fill Old Password (one time) and News Password (Two Times) and click on Change Password button. Through this way you have change the password of your account. Next time onwards, you must use it to login. Click on the Change Mobile No. tab after moving to My Profile Section. Update your old mobile number with new and verify it. Go to My Profile link on the menu bar. Click on Change Email tab and replace the old email with new one. Login to that particular email account and complete the verification process. 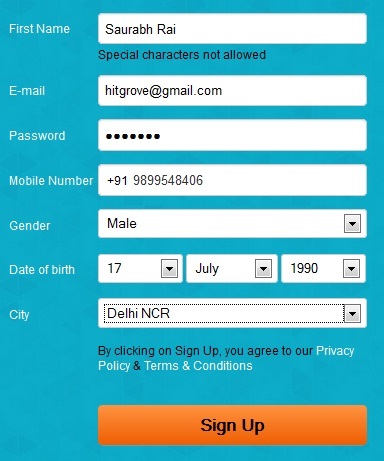 Remember, the new email id should be used to sign in into your OyeRecharge.com account. The question comes out, how to deactivate your account from the website with all your personal data. For that, you just need to click on Deactivate Account link (just below of Change Email). This will erase your account from the database. For any kind of inquiries, we suggest you to use this link. It is the official website’s contact page url. Fill the contact form with Name, Email Address, Subject, Comment and Submit it. It can be used for complaints, suggestions, feedback etc. kind of inquiries.